There is a tinge of sadness for Framingham's senior citizenry today with the announcement that papers have been passed for the sale which will lead to the eventual razing of the St. George Theatre in the heart of downtown Framingham. Whether they are still theatre patrons or not, this brings an awareness to many who have lived here all of their lives that an ending is in sight of an important era in the local community. Even before it was the St. George Theatre, this was the site of the Princess Theatre, one of the first theatres to be built for movies in the Boston area. It was owned by the Church Brothers and it's first picture operator when it opened on June 25, 1907 was Herbert N. Jost. Some years ago, Mr. Jost recalled that the feature back in those days ran only 1000 feet but took about 20 to 25 minutes to run off by hand. Matinees were held only on Wednesday and Saturday with no Sunday performances scheduled. Since these were the days of the silent films, the pianist was an important part of the theatre and the first one at the Princess was Gladys (Bates) Wells. Also on hand for the opening as a pianist, was Fred K Wess. Clarence D. Bartlett played cello, and Charles Archdale played drums. The musician's duty was to provide background music for the vocalist who would come off the wing as well as to play for the illustrated slides focused on the screen. Several years later Sunday evening programs were inaugurated. Sponsored by the late Rev. Pietro Maschi, Pastor of St. Tarcisius Church, the performances were the same as a weekday show but were allowed under the title of Sacred Sunday concerts. The theatre had a seating capacity of 500 and all performances were well attended. Back in 1955 when the motion picture industry was observing it's 50th anniversary, the Framingham theatre also participated in the observance. At that time, the News did considerable research and came up with some interesting facts and stories from the people who had been personally involved with what today can be called Framingham movie history. We learned that on one occasion in 1913 Miss Bates became ill and was unable to fill her duties as pianist. The ticket seller, Mrs. James Doone, the former Helen Sheehan, suggested to her cousin Mrs. William Galvin, the former Gertrude Collins, that she fill in for her at the piano. When Miss Bates announced she was not planning to return, Miss Collins gave up her position at the Dennison Mfg. Co. and succeeded her. Vaudeville at the Princess was of the highest caliber and among those who came here to entertain was Pat Rooney and the Days of '49. While the neighboring Gorman Theatre was featuring a variety of vaudeville shows as well as one-nighters which boasted such celebrities as Rudy Vallee, William S. Hart, Vincent Lopez, and Douglas Fairbanks Sr., who were just coming into their own, the Princess was also packing them in with all 25 cents seats reserved. Small, and with no balcony, it produced amateur shows and song slides as well as professional singers. Mrs. Galvin and a drummer provided background music for the silent pictures, song slides, and amateur entertainers. Clear in Mrs. Galvin's mind were those days when the amateurs who did not receive the wholehearted approval from the audience were pulled off with a large hook used by a stagehand behind the curtain. In 1914, Mrs. Edgar A. Bowers, the former Anna E. Lawless, joined the Princess staff as a pianist, working in this same capacity at the Milford Lyceum during the summer when the Framingham Theatre was closed. She followed this schedule for three years, returning from the Milford Theatre to the Princess each Labor Day. During this time the features ran all day on Saturdays beginning at 9 A.M. and continuing until 11 P.M. Sometime before 1917 the Princess was taken over by the George Giles Circuit Co. In 1917 it was torn down. 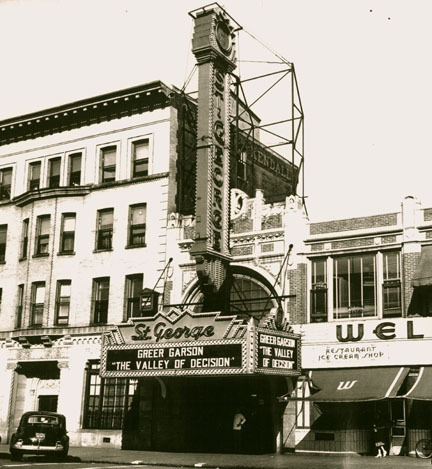 The new St. George Theatre on Concord St. opened for it's initial performance on Monday April 18, 1921. Feature of the evening was George Melford's famous production of "Behold My Wife" adapted from Sir Gilbert Packer's novel, the translation of a savage, together with a torch comedy, the latest pictorial news, and the added attraction of the opening exercises was an organ recital on the Robert Morton organ. Announcement of the opening stated that reserved seats would be available prior to that date. It was also announced that "the policy of the house will be to give a matinee and evening performance with extra performances on Holidays and Saturdays and whenever conditions warrant." 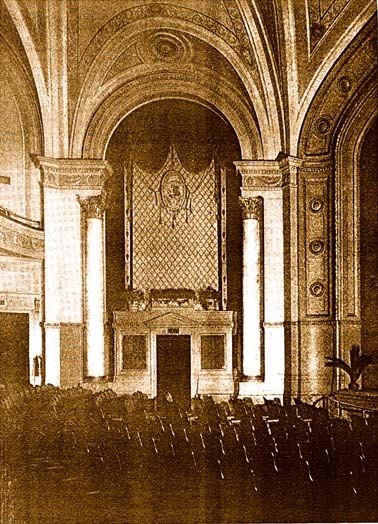 Our 50th Anniversary story with emphasis on the local theatres, reported that in 1928 the Giles Company installed sound in both theaters - meaning the Gorman and St. George. The late Alden Peterson of Framingham was General Manager for the Giles Company Theatres for 12 years and one of his many duties was to purchase pictures for the local movie houses. It also stated "the big year for vaudeville at the St. George was 1931." Anthony Capobianco was a long-time Manager of the Framingham theaters, dividing his time in each from the early '30's to the fall of 1952. When Mr. Capobianco left to enter the service in 1942, the late George Sumpter served as Manager of both. During this period, the demand for vaudeville decreased until it was eventually omitted from the program. After completing his three and one-half year hitch in the Armed Forces, Mr. Capobianco returned, and when the two downtown theaters were taken over by Smith Management, he was made Manager of both. Smith Management later became known as General Cinema Corporation. James Collins of Framingham, who has been Division Manager for the General Cinema Corp. since 1955, succeeded Mr. Sumpter, who resigned in 1945. John Berry of Framingham, an usher at the St. George during the 1940's, became the manager of the St. George, until it's closing. In 1966, two major fires hit downtown Framingham. First, the Fire of the Smith Building at the corner of Waverly St. and Hollis in Irving Square. The location is now the parking lot of the Store 24. Next, the block next to the St. George, home of Wellworth and many other stores on Concord and Howard St. This spot is also a parking lot today. The St. George remained open for one more year until it was closed and torn down.